ISLAMABAD, PAKISTAN — The Afghan Taliban says that it does not support Russia-sponsored multi-nation talks on Afghanistan because the process seems to be motivated solely by the “political agenda” of the organizers. 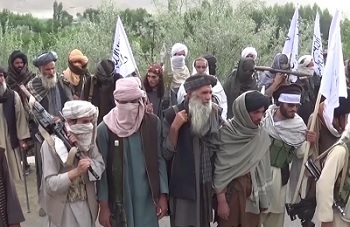 The Islamist insurgency issued its reaction a day before delegates from Afghanistan as well as its immediate and far neighbors are due to meet in Moscow to resume what Russian officials refer to as consultations on prospects for Afghan security and national reconciliation. Friday’s round of discussions will be the third Moscow has hosted since December, saying the effort is to encourage the Taliban to engage in peace talks with the Afghan government to end the protracted conflict. But the Taliban is dismissing Russia’s assertions about Moscow’s Afghan peace initiative, saying Friday’s meeting is one of many gatherings that routinely take place on Afghanistan without producing any results. “We cannot call these negotiations [in Moscow] as a dialogue for the restoration of peace in Afghanistan,” Taliban spokesman, Zabihullah Mujahid, told VOA. “This meeting [in Moscow] stems from political agendas of the countries who are organizing it. This has really nothing to do with us, nor do we support it,” Mujahid added. He reiterated insurgents’ traditional stance that U.S.-led foreign troops will have to leave Afghanistan before any conflict resolution talks are initiated. “Everybody knows that foreign occupation of Afghanistan is the fundamental problem,” said Mujahid. While China, Iran, Pakistan, India and Afghanistan participated in the last meeting of the Russian-sponsored talks that took place in February, former Soviet Central Asian states have been invited to to attend Friday’s meeting for the first time. The United States was also invited to the event but Washington turned it down, saying it was not informed of the agenda beforehand and was unclear of the meeting’s motives. American military officials suspect Russia’s so-called Afghan peace diplomacy is aimed at undermining the NATO-led mission in Afghanistan and have accused Moscow of arming the Taliban. Russian officials have strongly rejected allegations they are providing weapons to the Taliban, though they have publicly acknowledged maintaining contacts with the insurgents. Moscow insists the contacts are meant to promote Afghan peace and reconciliation, and to ensure the protection of Russian citizens in the country. In a separate statement issued on Thursday, the Taliban also denied receiving military aid from Russia, though the group defended “political understanding” with Afghanistan’s neighbors and regional countries. The Afghan delegation will again urge participants at the Moscow meeting to support a government-led reconciliation process, said Ahmad Shakib Mustaghani. Reiterating Afghan objections over Russia’s overt contacts with the Taliban, the spokesman told VOA on the eve of the talks that Kabul will emphasize that only state-to-state relations can help promote peace in Afghanistan and the Moscow process cannot be an alternative for Afghan-led reconciliation efforts. Russia’s stepped-up Afghan diplomacy apparently stems from concerns that continued Afghan hostilities will encourage Islamic State militants to expand influence in the country to try to infiltrate neighboring Central Asian states to undermine Moscow’s regional security interests.